Please like this post if you use SPF religiously! Not because you love the sun, you want to be tan. That's my defensive line. I also love morenas! But that doesn't mean I am willing to bake myself especially because I know that one, tan is a form of sun damage and two, sun damage is one of the topmost reason behind early skin aging! So defend yourself. 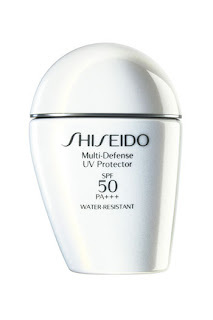 When it comes to protective skincare + summer, you know that SPF becomes indispensible. 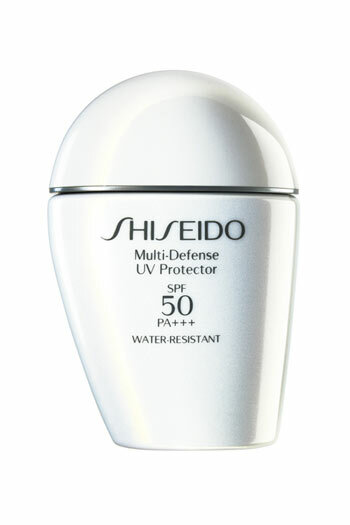 Here's a great investment for skincare...Shiseido Multi-Defense UV Protector. Don't underestimate its minimalist sleek bottle design. - SPF for the face is extremely important since unlike your body, you don't wear clothes to cover your face (unless you're lace-covered VMA Gaga daily, don't exempt yourself!). Hats also offer limited protection too as the shading the face only protects it from direct sunlight... but UV rays isn't just about direct exposure. UV rays, like with other forms of light, is reflected and can then leave your hat-shaded face exposed to danger without you being guarded enough! Don't deny yourself a reliable "defensive" best-friend. Please like this post if you don't take your skin for granted.